Blended exclusively from vintage tobaccos by Montecristo's famed Grupo de Maestros and expertly hand-rolled at cigar master Nestor Plasencia's Plasencia Cigars S.A. factory in Nicaragua, the medium- to full-bodied Espada by Montecristo cigars are the first Nicaraguan puros in the brand's long and illustrious history, and they are truly remarkable. The stunning 2010 Cuban-seed Habano wrapper covers 2009 Habano Jalapa binder and 2008 Habano Jalapa Seco, Jalapa Viso Ometepe, and Habano Condega Ligero fillers. The end result is a spectacular, extremely well-balanced cigar with layer upon layer of rich notes ranging from hearty wood, pepper, nuts, and coffee to creamy sweetness. 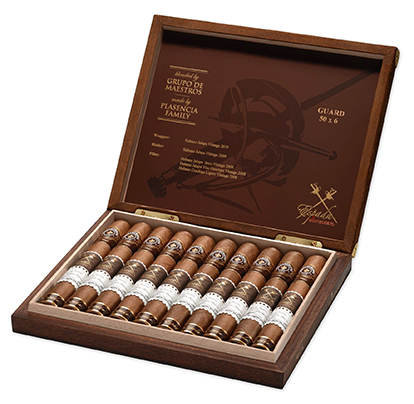 The Espadas, which means "sword" in Spanish, are available in three formats with names drawn from sword and knife terminology ~ Guard, Quillion, and Ricasso ~ and are presented in elegant suede-topped boxes of 10.